DELTA VFD5A5MS43ANSS is 2.2KW/3.0HP MS 300 series standard compact ac drives with sensorless control technology,which give 150% starting torques @3HZ frequency. 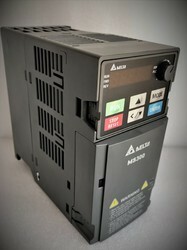 We offer the high quality of Industrial AC Drivers to our client. Besides the dynamic torque vector control, the inverter is equipped with the motor constant tuning for compensating even a voltage error of the main circuit devices and the magnetic flux observer of a new system. This realizes a high starting torque of 200% even at a low-speed rotation of 0.3 Hz. The inverter performs short-time acceleration and deceleration with the maximum capacity by extending the time spec of overload current ratings compared with our previous models. This improves the operation efficiency of the equipment such as cutting machine or conveyance machine. A brake circuit is built in the 22kW or smaller models as standard. The inverters with built-in brake circuit are available on request for 30 kW to 55 kW models in 200 V series and 30 kW to 110 kW models in 400 V series. 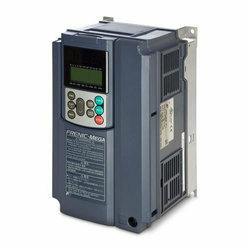 VFD4A2MS43ANSAA is 1.5KW/2.0HP ,3Phase,440V ,DELTA standard compact Sensorless Vector controls AC DRIVES with 150% Starting torque @3% HZ frequency and input PLC FUNTION for speed function .Also inbuilt dynamic breaking unit for cost saving . Also with modbus communications.